If you’ve been following our blog recently you’ll have seen our some of our recent posts, informing you on all the key information to do with dental implants. It’s one of our core treatments here at AP Smilecare, which means our experts have had years of experience in delivering the very best results for our patients. This week, we’re walking you through the process in detail, so that you know exactly what to expect when you go for treatment. Obviously, having a dental implant inserted involves at least one operation, or quite possibly several, so make sure that you’re prepared with that knowledge going in. You need to have healthy gums and your jawbone needs to be strong enough to support the implants. There are also various other factors – the effectiveness of the treatment can be affected by whether or not you’re a smoker, or if you’re undergone radiotherapy. Conditions like diabetes might similarly complicate things (although research into this is still ongoing). At AP Smilecare, you can count on us to carry out an exhaustive assessment, and we’ll let you know whether or not dental implants are suitable for you. Before we begin we’ll also sit you down to go through the risks and benefits of the treatment – this is a great time to ask us any questions or raise any concerns you might have. If you’re happy to go ahead, we’ll start by X-raying you to check the shape of your jawbone, and where it’s best to place the implant. You’ll be under local anaesthetic for this (which only affects one part of your body – in this case your mouth), but if you’re nervous, we also have dental sedation techniques to help you tackle your anxiety. To begin, we’ll drill a small hole into your jawbone, where your implant rod will go. Then we’ll pause to assess the area. It might be the case that we can go right ahead with inserting the implant rod there and then. Sometimes, though, your jawbone might need to heal first. This can take a few weeks or even sometimes months. This might be frustrating, but trust us – we put your welfare first! 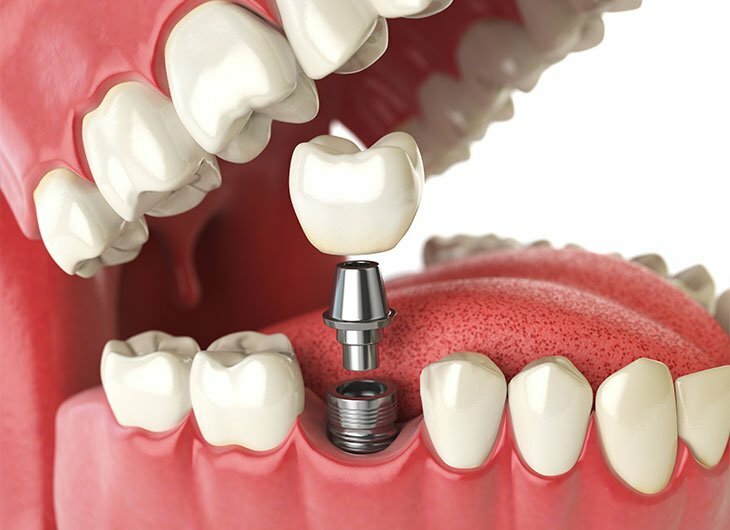 Once the implant rod has been inserted, the next step is to fit the abutment (the part that holds your false tooth in place). Again, this could be done immediately, or we might need to wait for your mouth to heal a bit before the abutment can be fixed. The timescale for this can vary, but we’ll always make sure we’re upfront with you about how long it might take. As you may have guessed by now, this might be done all in the same session, or it could be staggered over weeks or months. In some cases, it might take as many as between three to six months to heal. If you’re worried about how you might look in the meantime, there are options! You might need to have a bridge or partial dentures to cover the space between your teeth. After your mouth has successfully healed, you’ll then need to have another operation to uncover your gum from the top of the buried implant. Your final false tooth/teeth may well be fixed in place permanently, or they might be removable for when you need to clean them. Once the procedure has finished, you may well need to rest while you wait for the anaesthetic effects have passed. With local anaesthetic, it’s often several hours before the feeling comes back into your mouth. It can take 24 hours for sedatives to pass completely out of your system, which means you can’t drive yourself anywhere and it’s probably wise to have someone with you for the rest of the day – at least within shouting range! Try to stick to soft foods as you give your mouth time to recover. We think it’s worth reiterating that your welfare is our top priority here at AP Smilecare, so we may well schedule one or two follow up appointments just to check everything’s progressing well, and you’re coping OK at home. And remember the golden rule – don’t forget to keep your mouth clean! Brush your teeth at least twice a day, and make sure you do it properly. If you’re ever worried or anxious at any stage, don’t forget we’re always here for you to speak to. We pride ourselves on our level of patient care, so we make it a point to be always available for you to speak to! As well as dental implants, we also have a range of other core treatments here at AP Smilecare. You can click here to see them, or give our Blackburn dental clinic a call on 01254 297 000 to book an appointment.